For expert basement remodeling services in the St. Paul, Minnesota, area, trust the skilled team at U.S. Patio Systems and Home Remodeling to get the job done right. We understand how important your house is to you and your family, so finishing your basement just the way you always envisioned it would look is our top priority. Home office – You’ll be able to work unbothered for hours when you convert your unfinished basement into a quiet office space. Children’s play area – Increase the indoor space of your home so that you have dedicated space for your children to play and organize their toys. Guest quarters – It’s never fun to tell guests you don’t have a proper place for them to stay. 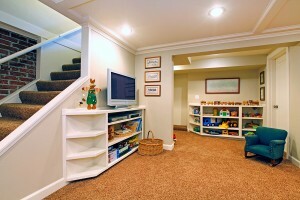 Finishing your basement could mean extra space for friends and family to stay when visiting. Entertainment space – Family movie nights will be more fun than ever when you transform your basement into an in-home movie theater for everyone to enjoy. At U.S. Patio Systems and Home Remodeling, our experienced team can turn your basement from a storage space no one gets to enjoy into a livable space for your family and friends. We can install lighting, insulation, wood framing, HVAC ductwork, basement kitchens, bathrooms, bedrooms, and more. Not only will remodeling your basement create a space to entertain and enjoy loved ones, it will also add livable square footage to your home, which can result in an increase in its value. To learn more about the basement remodeling services we offer to homeowners in the St. Paul, MN, area, contact U.S. Patio Systems and Home Remodeling.